Latest price of Oppo N1 in India was fetched online from Flipkart, Amazon, Snapdeal, Shopclues and Tata Cliq. OPPO gave us the first 13-megapixel camera smartphone and ever since then, this company has not looked back. Its latest offering, the N1, has again opened new possibilities in the world of smartphone p photography. Continuing with the legacy of innovation, Oppo has introduced the world’s first smartphone with a rotating camera in N1. You will be surprised to know that this unique rotating camera has been built from 67 different components. This camera also features a 206° rotation that firmly locks in position at any angle. There is just one camera for this smartphone, which can act as a front camera as well as a rear camera. Here are some specifications of this phone that will surely tempt you to buy one today. Design: The basic premise for the design of OPPO N1 is the dual line philosophy. The entire smartphone is wound by 2 finely-cut chamfers. These dual chamfers are visible from every angle and they run through the sides of the smartphone’s pure and simplistic design. The subtle curves and contours are reminiscent of its simple, yet amazing design. Camera: The most talked about feature of the OPPO N1 is the camera. You can take amazing photographs from all angles with the help of this smartphone’s swiveling 13MP camera. With different kinds of capture modes, such as High Speed and Slow Shutter, you will be ready to capture any precious moments of your life. Like any other high-end camera smartphone, the N1 is also equipped with a flash to light up dark places. Since the front and back cameras are shared, the smartphone needed dual flash design that would complement this camera. Therefore, the makers of this smartphone have developed a dual flash design that comprises a normal flash for back facing shots and a softer diffused light when the camera is flipped to the forward direction. Display: OPPO N1 has a 5.9-inch full HD screen and an immersive display that gives more clarity while viewing images or videos. The OPPO N1 smartphone has an ultra-sensitive multi-touch panel that supports input from fingertips, styluses, and gloves for unprecedented freedom on your smartphone. Storage & Battery: OPPO N1 smartphone has an internal storage of 16GB. The battery life of this phone is very good because of the Li-Ion 3610 mAh battery. Operating System and Processor: The OPPO N1 runs on the latest Android 4.2 and is powered by the 1.7GHz quad-core, Qualcomm Snapdragon 600 processor. 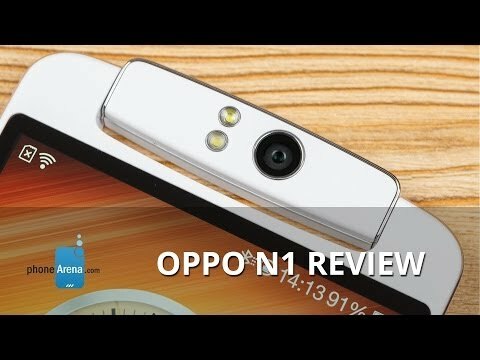 Connectivity: On the connectivity front, the OPPO N1 is a fantastic smartphone as it has almost all connectivity features that are needed for a smartphone. Some important connectivity options are Wi-Fi, Bluetooth, 3.5mm jack, 3G, etc. Privacy Guard: The OPPO N1 has a built-in system called Privacy Guard that lets you easily manage how much information your applications can access. The OPPO N1 is the latest smartphone from this company and has a multitude of features including a rotating camera. You will surely like to have this phone when you take it in your hands.